This recipe is a nice diversion from the tomato sauce-y recipes out there. Don’t get me wrong. I know people LOVE their meatloaf and ketchup, but the sweetness of the compote and the salty addition of bacon make this meatloaf pretty dang special. And when I say special, I really mean DELICIOUS. In a large skillet over medium heat, add sliced onions and about 1-2 Tbsp. of balsamic vinegar. Stir until cooked down and then turn heat down to low. Stir occasionally as the onions carmelize. In a bowl, mix together meat, spices, egg, and celery. After onions are done, let them cool a bit. 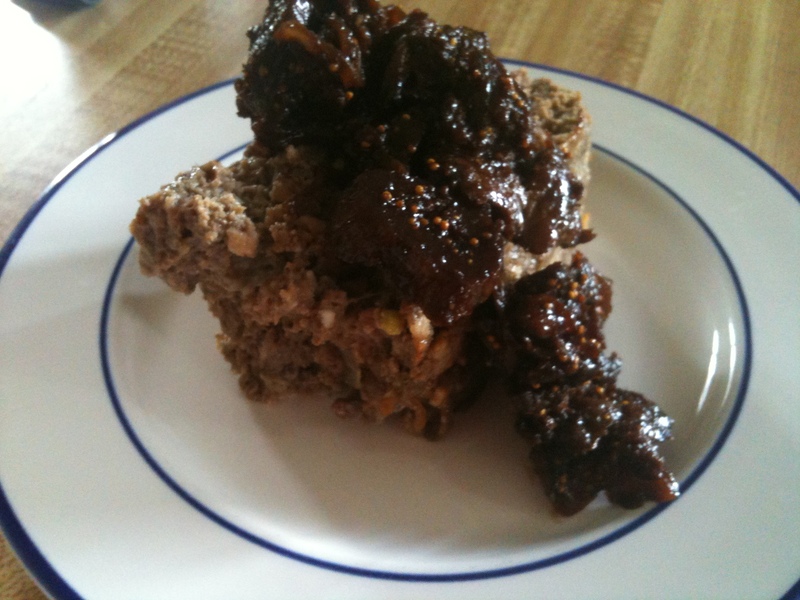 Press meatloaf into a large loaf pan or 8 x 8 baking dish. Bake for about 45 mins until it reaches and internal temperature of 165. In the onion skillet, add water, vinegar, herb sprig, and figs. Simmer over medium heat until figs are soft and the sauce begins to thicken. If compote is too sour, cook longer. If too sweet, add some vinegar.